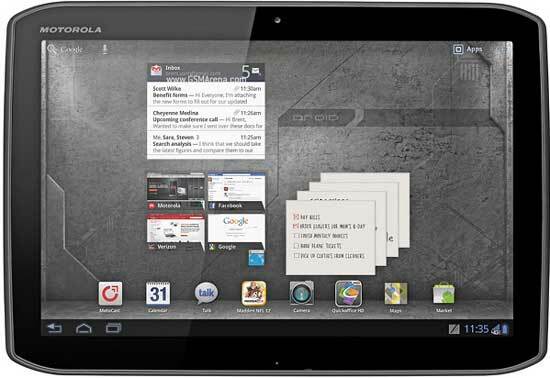 Last month almost silently Motorola introduces Xoom 2 tablet along with 8.2’’ media edition. Now I repeat the news courtesy of Verizon. They just announced those new Android tablets with the white Motorola Droid RAZR. The DROID XYBOARD tablets come in 10.1" and 8.2" size, just like as Motorola Xoom 2 and Xoom 2 Media Edition. Surely these are the LTE editions of the new Motorola tablets. Both of the DROID XYBOARD tablet has 1280x800 pixel IPS displays and 1.2GHz dual-core processors bundled with 1GB of RAM. They have Wi-Fi and a HDMI port with quite unusual infrared port. But with the help of this port you can use the tablets as remote control. The 4G LTE connection can be used as a mobile hotspot, allowing up to eight Wi-Fi tethered devices to connect. Both the 10.1-inch and 8.2-inch DROID XYBOARDs will be available by the end of the year. Price of DROID XYBOARD 10.1 are $529.99(16GB), $629.99(32GB) and $729.99(64GB). As for the DROID XYBOARD 8.2, only 16GB and 32GB version will be available for $429.99 and $529.99, respectively. I am pretty sure that the price is quite affordable when you are getting 4G LTE dual-core Android tablet at this price range.